A starship appears in orbit above Atlantis, the early warning systems failed to detect its approach and to confuse matters they are getting the automated friend or for response indicating that the ship is the Daedalus, however they confirm that ship is days away from Earth on it’s return journey from Pegasus. The team take a jumper and they discover a carbon copy of the Daedalus however it shows signs of extensive battle damage and no one is onboard, well there are four bodies and they do look rather familiar. 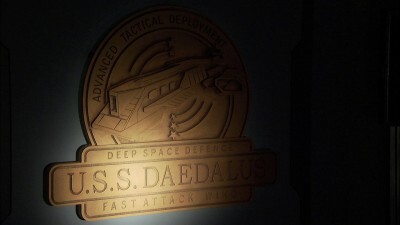 A strange energy signature is detected and McKay discovers that the ship has an additional drive system, he realises it is intended to jump the ship between alternate realities and that this Daedalus is not from their universe. Alas the drive is in a loop and when it’s energy capacitors are fully charged it automatically jumps, who knows how long they “other” team were onboard or how far away from their home they were before conditions killed them. Each reality poses it’s own problems for the ship and the team including a sun eating it’s system, aliens hell bent on destroying another Atlantis and one where there is no live at all on the planet and not Atlantis either. McKay finally figures out that while he can not stop the ship from jumping he can reverse its course and if they survive the sun going nova and the aliens once again they can leave the ship when they reach their reality and let the ship do it’s thing, of course complications arise when the landing bay and jumpers are destroyed by those pesky aliens but not to worry they have a plan. The Daedalus Variations is a well crafted episode which makes good use of story elements introduced on Atlantis earlier and certainly in the scifi genre as a whole. There is some excellent space combat sequences, really old school dog fighting in and around the Daedalus and again all the CGI done in house both for budgetary reasons as well as showing the talents of the Stargate artists. There is not a huge amount of pressure put on the actors in terms of what the story needs from the characters but we get some good humorous moments and some cheesy ones it has to be said but overall The Daedalus Variations is a solid episode early in the final season of the show.